No, this was not taken with a tilt shift lens (but wouldn’t that be fun?). These little utensils are not decorative miniatures, they are not dollhouse wares, nor are they intended for making teeny tiny meals. 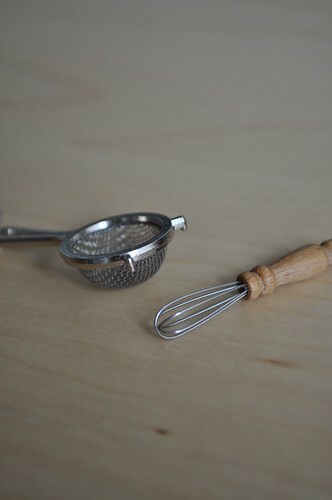 This whisk and this sieve…. They’re earrings! Adorable kitchen utensil earrings. Chris’ mom…er…the Easter Bunny picked them up mostly because they were all kinds of cute and very much up my alley, though with no strong assumptions that I’d wear them. I have to say, though, I’m totally in love with them. They’re well-made and, despite what one might think, don’t look or feel tacky at all. I’m not a particularly eclectic person, but these fall just within my personal range of quirky enough to be interesting yet still wearable. And if I ever need to rinse a lentil or two, I’m all set. haha!! sooo cute and love the lentil rinse comment. Love it, they actually look really adorable and awesome. Your a lucky little bunny. Hahahhahaha,..Ilove them,..how cute & adorable & certainly very apart!Many greetings from sunny Brussels, Belgium!! !